I don’t know why I do this to myself. But between this and HANSEL AND GRETEL: WITCH HUNTERS (which I have yet to post as it is being saved for a certain odoriferous summer series), I’ve seen two of the least liked mainstream movies of 2013 in the past week. Oh well. I watched R.I.P.D. (2013) on 6.21.14. It was my first viewing of the film. The first ten minutes of this movie are not entirely terrible. We are introduced to Nick (Ryan Reynolds) and his partner Hayes (Kevin Bacon). They have stolen some gold, but Nick is second guessing whether or not to keep it. The two end up at another bust and the filming recalls first-person shooter video games as the camera zooms into and out from potential targets as the protagonists pick them off. Then Nick is killed off (not a spoiler, as it is the entire premise of the film) and he is given the chance to continue as a police officer in the R.I.P.D. with a Wild West era sheriff, Roy (Jeff Bridges). It is from this point forward that the film becomes unnecessary. Not horrendous. Not terrible. Just unnecessary. The idea is that people live their lives normally, yet there are a whole group of dead people disguised as normal people. Only when they are exposed (to Indian food, for some reason) they become other worldly monsters. There is some sort of artifact which will do bad things and the bad guys want to do those things. The R.I.P.D. is there, secretly, to thanklessly keep people safe. If this all sounds like MEN IN BLACK, but with dead people instead of aliens, that is because it is exactly like those films. And that is why this movie proves so unnecessary. It doesn’t do anything that the first MEN IN BLACK didn’t do, only R.I.P.D. does none of it as well. Even nearly two decades after that M.I.B. was released, R.I.P.D. does not do a better job with character, plot, jokes, or even special effects. Ryan Reynolds is fine as the hero. 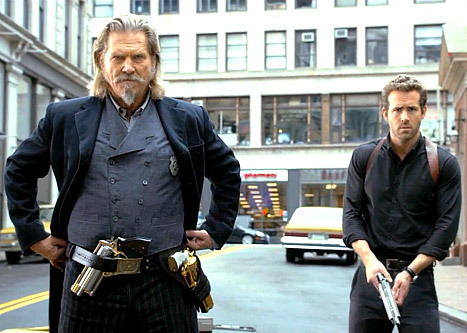 Jeff Bridges does more with his character than the script seemingly provides. With everything else feeling like a cheap version of what could have been a bigger and better movie, the performances are better than the result of the film (and even those performances are nothing of major note). There just is not much to say about R.I.P.D. I know the comic book it was based off of has a nice following, and I hear those people were some of the most disappointed. The entire first film is a set up for a franchise which it seems noone is eager for. This wasn’t the worst movie of 2013, but it might have been the most pointless. ~ by johnlink00 on June 21, 2014. Funny, he loves RIPD too lol. I just talked to someone else who loved H&G yesterday. And apparently so does all of Europe, because they went to it enough to have gotten a sequel green lit. Maybe he’ll be a connoisseur of bad movies! My son is almost four and he just watches Wall-E twice a day.